While getting through locked doors is generally considered the vocation of thieves it can also be a handy skill in a lot of other scenarios, the most common being when a key for a door around the house or office has become locked. Sometimes it can also be a very handy skill in an emergency, for example should a relative or friend fall in the shower and the door needs to be opened to help them. Fortunately there are several ways in which you can open a locked door or otherwise get through. The first and perhaps best known is to pick the lock. Specialist lock-pick sets can be purchased online for not very much at all and these will make the whole process a lot easier. That said, a lock pick set is still not something that many of us happen to have lying around in case of emergency which means there’s often a good chance you won’t have one when it’s needed. In these scenarios any two long thin implements can be used – such as hairpins or paper clips straightened out. From here the idea is to manoeuvre the tools in such a way that you can clear the passage way or ‘chamber’ inside. Most locks around the house these days use a cylinder locking mechanism, which works by using tiny metal pins that fit inside the cylinder to prevent it from turning. With the two tools or lock picks you can then feel around for these pins and push them up and out. This is however very fiddly and can take time if you’re not practiced. For this reason it’s not suitable for an emergency. In the case of an emergency then (or if you’ve just given up with the fiddly lock picking), you may want to break the door down. On TV you may have seen people barging the door down with their shoulder but in reality this is a fast track to a dislocated arm. Instead you’re much better off kicking the door with the heel of your shoe and aiming for the weakest point on the door. Often it pays to kick the actual handle itself, as the wood here is usually thinnest and most hollow to allow for the locking mechanism (ironically). Failing this, aim for the area just left of the handle (assuming the lock is on the right) as this area will be structurally the weakest being furthest from the edges and nearest to the thing handle area. This obviously should still be reserved for the most pressing occasions only. Depending on what you’re locked out of you may also want to consider breaking in through a window, or climbing in through a window if its been left open. Again if you are breaking a window to get in then you are causing damage to your property and also dealing with dangerous shards of glass. Additionally you will have to be ready to show ID and proof of address if you are stopped by the police. 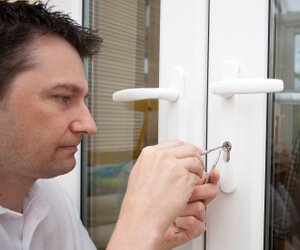 Of course if you’re in no hurry you can save yourself a lot of time and money by calling a locksmith.